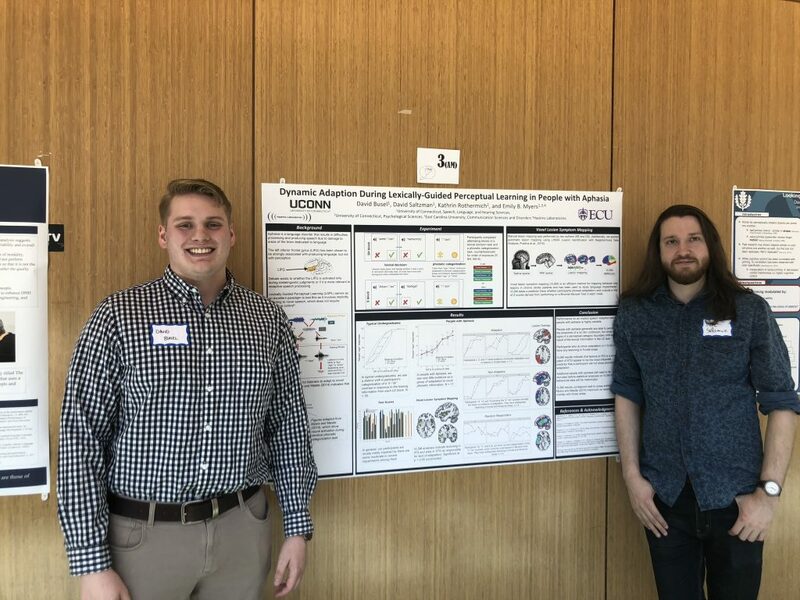 Strong showing from the LAB lab at UConn LangFest 2018! The LAB lab would like to acknowledge its excellent undergraduates for their participation at this year’s UConn Language Fest! 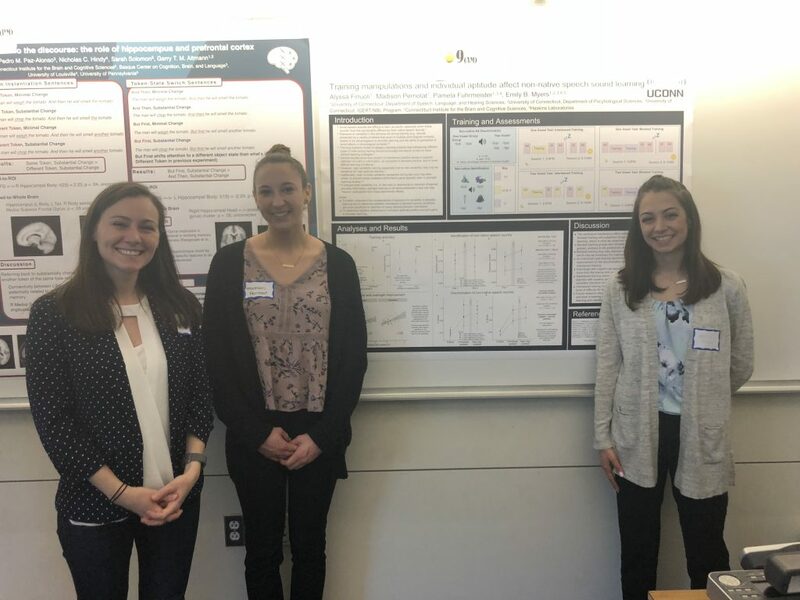 This year, there were two posters created and presented by undergraduate researchers in addition to two posters presented by senior lab members. 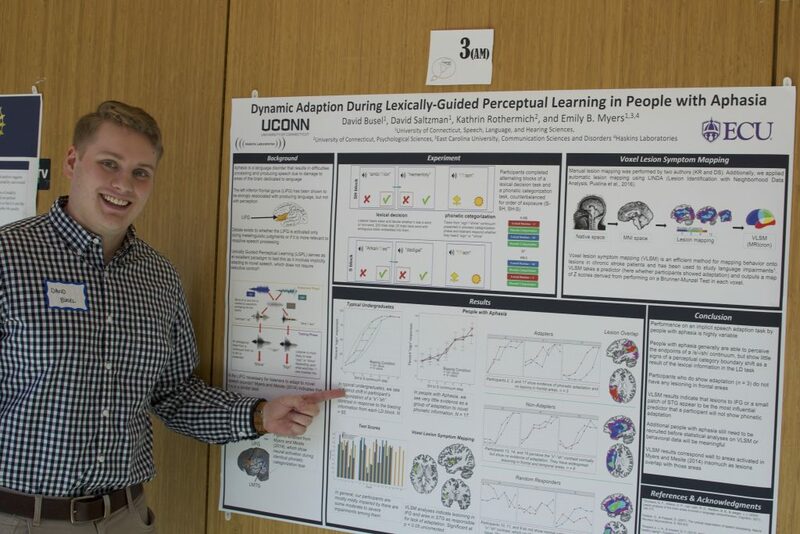 David Busel, a senior SLHS major, presented a poster entitled “Dynamic Adaptation During Lexically-Guided Perceptual Learning in People with Aphasia”, following up on work he has done for the last year in the LAB lab in conjunction with David Saltzman and lab almuna Kathrin Rothermich. This project sought to understand the role of frontal brain areas in adapting to novel phonetic information by having people with aphasia engage in an experiment that requires them to implicitly adapt to an “accented” talker. 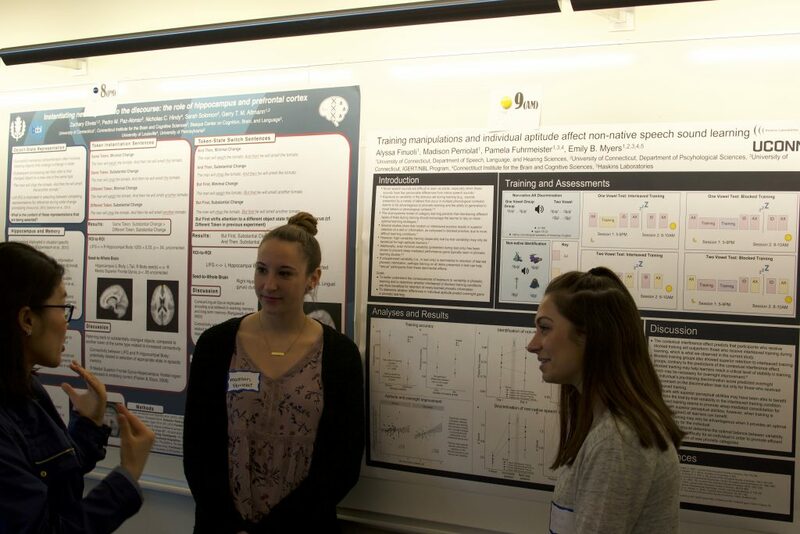 Alyssa Finuoli and Madison Perriolat, both junior SLHS majors, presented a poster entitled “Training manipulations and individual aptitude affect non-native speech sound learning”, which came from work in conjunction with graduate student Pam Fuhrmeister. 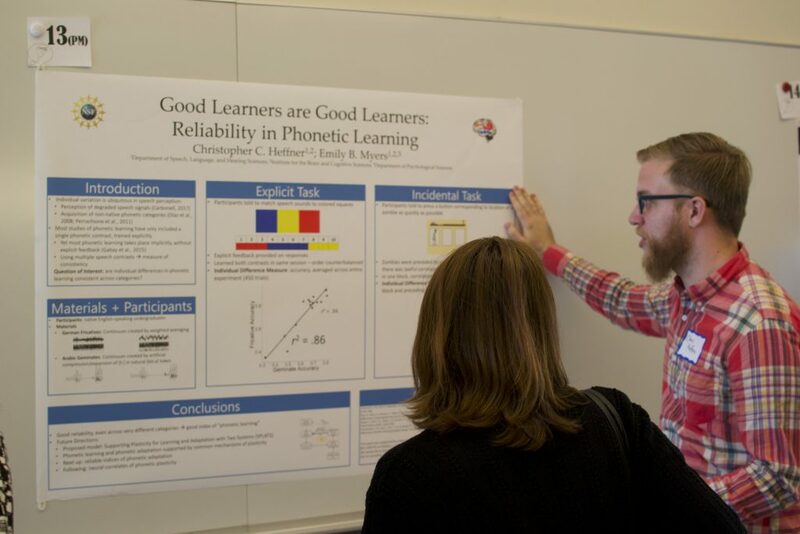 This project sought to find the most advantageous approach to teaching listeners unfamiliar non-native speech sounds by manipulating the kinds of training participants received. New LAB Lab Publication in Neuroscience Letters! Lab alumnus F. Sayako Earle (Assistant Professor, University of Delaware) and LAB Lab PI Emily Myers, along with UConn Speech, Language, & Hearing Sciences faculty member Nicole Landi have a new publication in Neuroscience Letters entitled “Adults with Specific Language Impairment fail to consolidate speech sounds during sleep”. A PDF is available upon request. New LAB Lab publication in the Journal of Memory and Language! Recent LAB Lab graduate Xin Xie and PI Emily Myers have a new publication in the Journal of Memory and Language entitled: “Learning a talker or learning an accent: Acoustic similarity constrains generalization of foreign accent adaptation to new talkers”. Check it out here. New LAB Lab publication in the Journal of the Acoustical Society of America – Express Letters! LAB Lab member Pamela Fuhrmeister and PI Emily Myers have a new publication in JASA-EL entitled “Non-native phonetic learning is destabilized by exposure to phonological variability before and after training”! Check it out here. New LAB Lab publication in the Psychonomic Bulletin & Review! 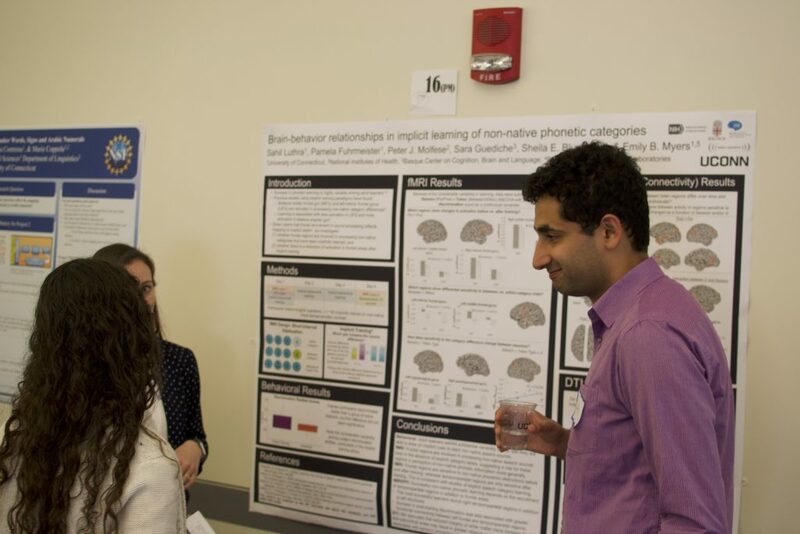 LAB Lab member David Saltzman and PI Emily Myers have a new publication in the Psychonomic Bulletin & Review entitled “Listeners are maximally flexible in updating phonetic beliefs over time”. A PDF copy is available upon request. Belated welcome to new members Sahil Luthra and David Saltzman! Two new lab members joined us in 2016, IGERT fellow Sahil Luthra, and lab manager David Saltzman. Lab alumnus Xin Xie has a new publication alongside Dr. Emily Myers in the Journal of Memory and Language entitled “Learning a Talker or Learning an Accent: Acoustic Similarity Constrains Generalization of Foreign Accent Adaptation to New Talkers”. The article is accessible here. LAB Lab PhD student Sahil Luthra successfully defends master’s thesis! LAB Lab postdoc Dr. Chris Heffner accepts faculty position!